In a rotating shaft at which instability occurs is called Whirling of Shaft or critical speed. When shaft reaches critical speed it will have maximum deflection. It is applicable in power transmitting equipment like a turbine, propeller shafts, etc. 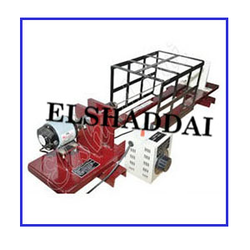 We are offering Whirling of Shaft Apparatus to our clients. - Shafts made from steel & of the – following nominal dimensions. - Drive ‘PROMPT’ make single phase AC/DC fractional HP 6000 RPM. - Dimmer stat for controlling of Z Amps speed. Whirling of Shafts apparatus shows how shafts vibrate transversely and whirl at a certain rotation frequency. Drive motor: 5000 rpm, FHP. - Both ends directionally free. Whirling of Shaft with 3 shafts, 2 set of different bearing ends, Safety guard, speed controller, flexible shaft etc. Duly mounted on the solid frame with FHP Motor drive. We are an acclaimed name occupied in offering our precious clients a superior quality range of Whirling Shaft Apparatus. - Length: 1000 mm each. - Kinematic coupling bearing for fixed or free ends without restraint. - Shafts made from steel and of the following nominal dimensions. - Diameter mm. (inch) Length mm. (inch). - 4.5 or (3/16) 900 or (36). - 6 or (1/4) 900 or (36).